Tara, a rural town, is 80 km west of Dalby and 280 km west of central Brisbane. It was named after the Tara pastoral station (1852), one of several occupying the Tara district during the second half of the nineteenth century. The earliest pastoral run was taken up in 1848. 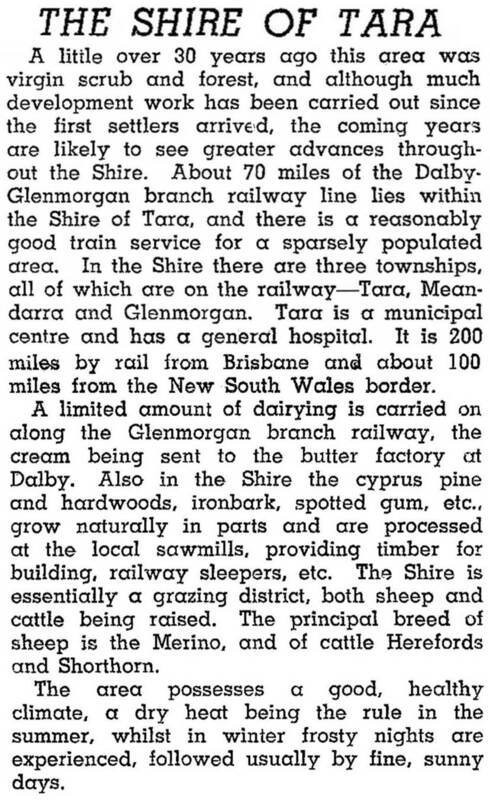 The area was sheep country, usually dotted with brigalow (Acacia harpophylla) and belah (Casuarina cristata), but east of Tara there was valuable ironbark, spotted gum and cypress pine. Most of the pastoral stations were subdivided for closer-settlement during 1906-13 under the Queensland Government Group Settlement Scheme. Many settlers came from Victoria. The Tara township began as a reserve in 1909 with two boarding houses, a surveyors' camp, a couple of stores and a canvas town of new arrivals. Town allotments were sold, a progress association started in 1910, and a provisional school opened in 1911. The Methodist Home Mission started its Tara branch in 1910, and opened the first church in 1914. At about that time the prickly pear invasion worsened, and by the 1920s much of the land south of the township was infested. Tara became known as a drought-stricken, death-adder infested land of little or no promise. There was a steady growth in population through to the 1950s, when at last Tara experienced prosperity, sharing in the general postwar boom. An electric power plant was commissioned in 1952, a soldiers' memorial hall completed by 1954 and a high school department opened in 1961. Tara Shire had an area of 11,680 sq km and was drained south-westwards by the Moonie River, under which is the Surat-Bowen sedimentary basin. In 1961 the historically important Moonie oil field came into production. Australia's first commercial oil producer, it was a Stock Exchange sensation, although the output leveled out to under 1% of Australian production. Agriculture remained the Shire's economic mainstay. In 1993 there were 403,000 sheep, 76,000 lambs, 95,000 beef cattle and 90,000 ha under cereal crops. The shire produced top quality prime hard wheat, and there is a large wheat depot in Meandarra. In 2008 Tara Shire was amalgamated with Dalby Town, Chinchilla, Murilla, Wambo and the southern part of Taroom Shire to form Dalby Regional Council.